Seagram’s Royal Stag has announced their all new campaign, ‘It Starts with You. Make it Large’. The campaign features seven world class cricketers – South Africa’s Faf du Plessis, England’s Ben Stokes, India’s KL Rahul, West Indies’ Andre Russel, New Zealand’s Kane Williamson, Australia’s Mitchell Starc & Sri Lanka’s Angelo Mathews. With the ICC World Cup around the corner, Royal Stag, which also is now a partner to ICC, has enrolled this legendary brigade of brand ambassadors who are the perfect personification of dreaming, achieving and making it large. Talking about the association with global cricket idols, he further added, “We have signed on these legendary icons who embody the brand in sweat, spirit and hard work. Their journey from debut to date, has been inspirational, where now, they are unanimously acknowledged as one of the prominent players of the game, across all formats”. 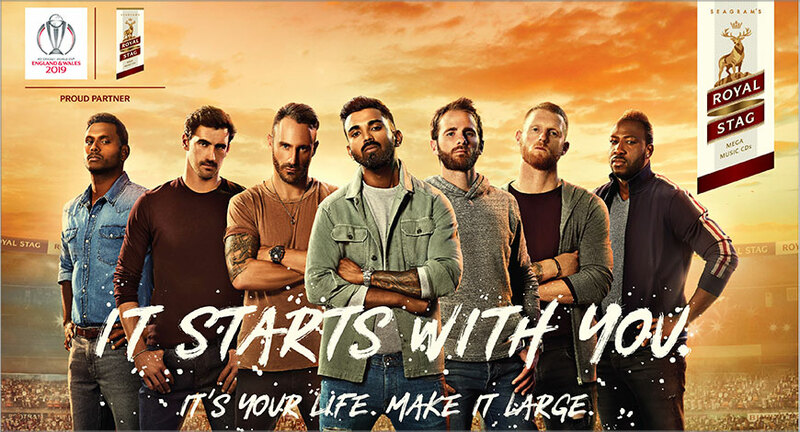 This new campaign and the association with global cricketers defines the larger than life attitude by bringing forth such individuals who aspire to make it large in every aspect of their lives and communicates the brand’s ideology in a truly fast-paced and universal way.